Note: Recording a phone call without the permission of other party is illegal in many countries and we are in not promoting it in any manner. We are not responsible for any kind of trouble caused due to phone recording. There are hundreds of phone recorder apps available on Google Play store but, not all of them are effective. Most of them are paid or lacks certain important features. However, there are few apps which works perfectly fine. Call recorder ACR is one of them. It is currently the highest rated call recording app on Google Play store. You can record incoming and outgoing calls by using this app. It offers some amazing features like auto/manual call recording, password protection of call recordings, auto deleting the old recordings etc. You can also mark the recordings important so that they don’t get auto deleted. Another remarkable feature of the app is that it supports cloud service which means you can save your recordings to cloud storage. You can even choose the format for recording like MP3, 3gp, AAC etc. How to Use Call Recorder ACR? 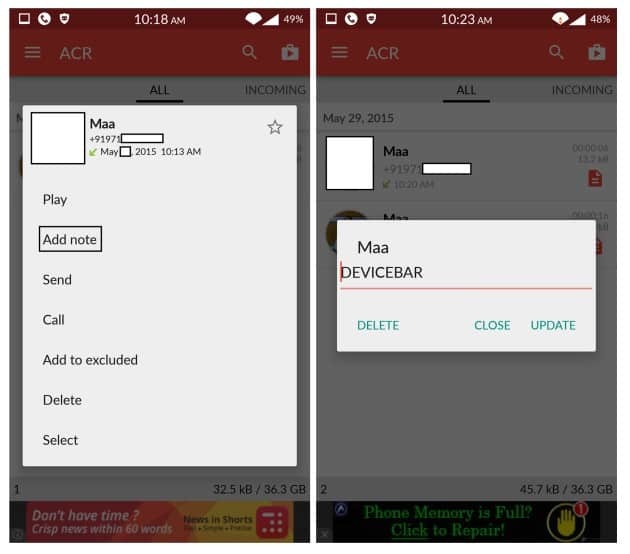 It is very simple to use Call Recorder ACR. You just need to follow the below mentioned steps and you will be able to use Call Recorder ACR like a pro. Make sure there is no other call recorder app installed on your Android phone or else it will not work. 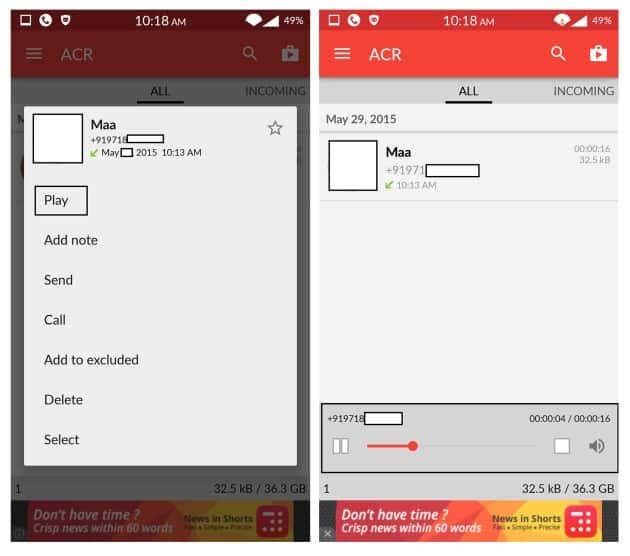 Download and install Call Recorder ACR on your Android device. It is small in size and is available on Google Play Store. Open the App. 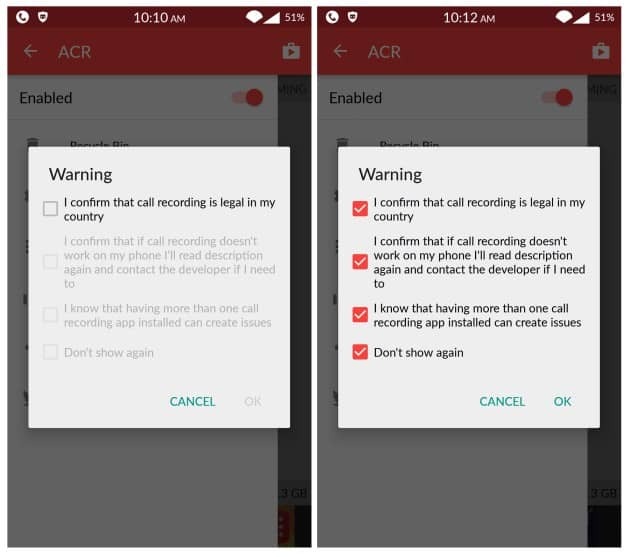 It will ask you to confirm that call recording is legal in your country. Tick the option at your own risk and press ok. It will also show three more warnings, tick mark all of them and press ok.
You don’t have to do anything. Just pick up or make the call like you do and do the conversation. Now, after the conversation, open the Call Recorder App and you will see the log. It is divided into all, incoming and outgoing parts. Go to all and click on the conversation you need to hear. It will show you a list of options. Press the play button to hear the recording. Now, you will see that the recording has start playing on the screen. You can pause/play it. You can also add a note to a recording. Just press on the recording on which you need to add a note and select “Add note”. Type the note and it will get added. Now, click on the red button on the recording to see the note. You can delete/update the note. You can also share a recording with your friend via WhatsApp, Gmail, and Bluetooth etc. To set password for recordings, go to Settings > General and press on the very first option. Set the password as per your choice. Just open the settings for Cloud Services and you will be able to choose the service for cloud storage. Just play with the app for 10-15 minutes and you will understand each and every aspect of the app. 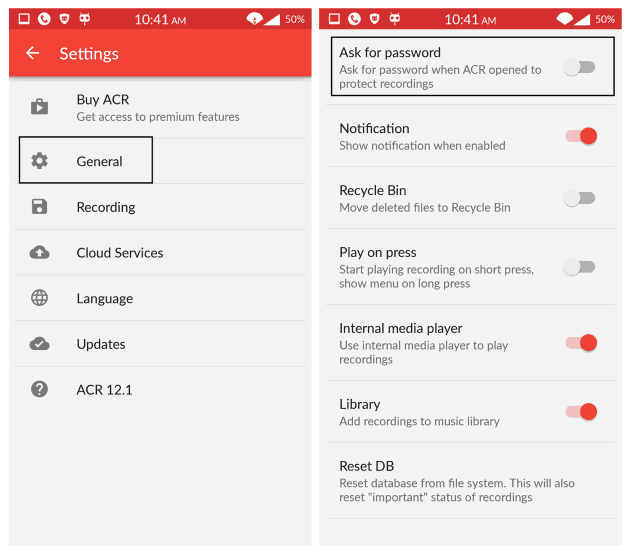 Here are few alternatives which work just like Call Recorder ACR. However, you can use only one call recorder at a same time. All these are free to use. Try the app on your own and let us know how much you liked it. If you have any issues with the app, do let us know in the comments below.